On my short list of places to visit next is Japan. My first step in learning about a new country is reading the Culture Shock! book for that country. CultureShock! 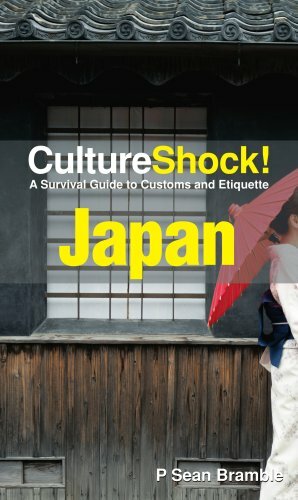 Japan: A Survival Guide to Customs and Etiquette (Culture Shock! Guides) by P. Sean Bramble by P. Sean Bramble is the best Culture Shock! I’ve read so far. I learned a lot about Japanese culture and the author has a great sense of humor. If you pick up this book, be sure to get the 2005 edition. The 2004 edition has quite a few negative reviews. The book covers proper etiquette for eating, exchanging business cards and something interesting that occurs at funerals. Since cremation in Japan is done at a comparatively low temperature, the bones of the deceased will not be completely consumed. Instead, it is the duty of the immediate family members to break those bones apart by hand into smaller pieces. And as a non-chopstick user, I was pleased to learn on page 169 that Japanese people use their hands, not chopsticks, to eat sushi. Works for me. My only complaint of the book is the Index is lacking. After reading the book, I wanted to go back to certain pages, but they weren’t listed on the page index. Other than that I really enjoyed this book. Now I just need enough time off from work to see the country.